"It really is crucial that you work with good quality essential oils"
I buy essential oils online all the time, so hopefully this info will make sure you buy the best quality pure products, and at the same time help Save a little cash! Many recipes, remedies and craft projects here at SavvyHomemade include organic essential oils and carrier oils as ingredients. You can learn more about the uses and properties of these oils in my essential oil use chart and carrier oil chart. So, I need to share some of my experience on the benefits of these oils, along with how and where to buy essential oils online at cheaper wholesale prices. I’m very selective when buying these oils and below I explain the main reasons why in detail. Over the years Iv’e purchased the majority of my oils from Mountain Rose who offer a pain-free buying process at very reasonable prices. They only sell high-quality products that you can rely on and have a diverse selection. If you’re new to using essential oils they also have some of the best options for starter collections to help you on your way. Mountain Rose have been sponsoring SavvyHomemade for some time now and they have provided much-needed support for the work we do here. So if you click over and make a purchase we will make a small commission, this in no way affects our opinion about their products, it just helps to pay the bills at SavvyHomemade. If you do make a purchase we would like to say a big fat, sincere Thank You! For more info see my disclosure document here. I also buy lots of oils from Amazon sellers that I’ve come to trust. These are family-run companies like Plant Therapy, Plant Guru and Edens Garden, they all offer quality oils at wholesale prices. If you live in the UK you can also buy from Amazon, but again make sure you go to established, quality suppliers like Naissance, Mystic Moments or Fresh Skin Beauty. Essential oils have a very deep natural aroma, this can psychologically offer soothing or stimulation benefits by triggering the brain. Essential oil components also enter the lungs when used correctly and when applied to your skin they absorb into the bloodstream, providing you with an actual physical benefit. Essential oils help save lives as well as help in the treatment of serious diseases such as Tuberculosis and Alzheimer’s, some oils assist us with high blood pressure and even anthrax. Essential oils must be used with care – they are very concentrated, and in the pure form, can irritate your skin. Essential oils are commonly diluted with “carrier” oils such as sweet almond, apricot kernel, grape seed, or jojoba, and stored in brown or blue glass bottles to protect potency. Essential oil relaxing properties are well known. But now scientists across the globe are discovering that some of these oils are much more than just a lovely smell! It really is crucial that you work with good quality essential oils that are clear of synthetic additives. Oils containing additives will increase the probability of any allergy symptoms and will never deliver the results you’re looking for. Inferior oils that are often distilled from substandard crops handled incorrectly, or altered using chemicals will lack the therapeutic benefits found in pure quality oils. So be sure to buy from a supplier of pure, high-quality essential oils. Pay attention to phrases such as ‘fragrance oil’, ‘nature identical oil’, or ‘perfume oil’ Some of these terms suggest that the oil is not pure. These are ok for soap making but not so good in homemade beauty recipes. Essential oils that are 100% pure should last about 2 years if kept in a cool dark place but other ingredients can go out of date much quicker. Unless otherwise stated try to use your creams and lotions within 6 weeks of making them. When buying other ingredients, check the shelf life and only buy the amount you are likely to use, buying in bulk sometimes pays, but not always. Never use citrus oils when going out into the sun as this can cause photo-toxicity. And certain essential oils should be avoided during pregnancy, always check before using. Sterilize all your jars and bottles, glass jars and bottles can be sterilized in a low oven 100f (40c) place them on their sides for about 10 minutes. Where Can I Buy Essential Oils Online? Mountain Rose Herbs is an accomplished organic processor, it is certified via Oregon Tilth that’s wholly accredited by the National Organic Program (Usda). Ever since 1987 they have supplied an ever growing loyal customer base with pure organic essential oils, along with other natural ingredients such as carrier oils, butters, waxes, organic herbs, spices and teas. Mountain Rose Herbs is actually cheaper when compared with the majority of wholesale stores for essential oils online. It offers significant savings up to 25% off whenever you purchase bulk herbs, spices and teas. On top of that the packaged retail items from both Mountain Rose Herbs and other producers which are bought in quantities of six or more (of the identical product) are eligible for a 25% discount. The majority of buying is completed securely online but the company also accepts mail orders, phone orders, fax orders and even pick up directly from its Eugene location. And a free of charge sixty four page catalog is also obtainable via post. After you’ve submitted an order you’ll be informed immediately that it has securely reached their office and will then be processed and shipped out. Generally within one working day though sometimes it stretches to two trading days, for more info take a look at the Ordering Info Page here. Make sure you have a look through the clearance and monthly specials that they offer. You can discover quite a few great bargains on a wide selection of products. A number of the reduced prices will be as much as 40% off the normal rates. In the event that you are unsatisfied with the items you received, it is possible to send them back within two months of purchase for a complete refund, With no hassle! This is just a brief overview of what’s available from this top quality supplier. To get the full experience spend a little time browsing Mountain Rose Herbs. Below I’m providing 10 links to help guide you when buying your very first oils, this is based upon Valerie Worwood’s recommendations in her Complete Book of Essential Oils. Other than this you could buy a ready combined set, simply go for one of the Mountain Rose options for starter collections to get you started. I also buy oils from trusted Amazon sellers like Plant Therapy, Plant Guru and Edens Garden, they all offer quality oils at wholesale prices. These companies have all been trading a long time on Amazon. They are all family run businesses which I always tend to trust a little more and I’m happy to recommend them. They travel the world to source the best quality essential oils often at more affordable prices than over here. The benefit here is obvious; you can shop with confidence at the largest online store in the world and it’s quite easy to get your selection fast and at the best price. If you live in the UK you can also buy from Amazon, but again make sure you go to established, quality suppliers like Naissance, Mystic Moments or Fresh Skin Beauty. I normally restrict my search on Amazon to a few select companies using ‘Brands’ option on the left hand navigation, or I go direct to the company Store fronts… I go for trusted Amazon sellers like Plant Therapy, Plant Guru and Edens Garden. I also love the Essential Oil starter kits below because financially speaking they would cost up to 40% more if purchased on their own. At 10ml or 5ml the bottles are a great size; not too much and not too little. The fragrances are very potent and smell clean and pure. The lemon smells like lemon and the lavender smells like lavender. And to top all of that they are available on Amazon and can even be gift wrapped! This oil set is available at Amazon and contains high quality, cerified 100% pure oils in 10ml bottles. 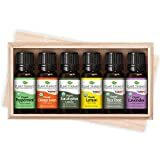 Also available at Amazon this Set includes 14 x 10ml essential oils and it is supplied in a wooden box. 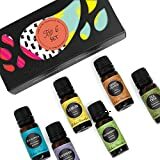 This sampler set is available at Amazon, it contains high quality therapeutic grade oils and you can get either 5ml or 10ml bottles. Essential Oil Set 20-5 ml 100% Pure Therapeutic Grade for Aromatherapy Diffuser, Skin, Body, Hair. Perfect for DYI Crafts, Soap, Lotion, Cream, Lip Balm and Candle Making. This set is also available at Amazon, its a Pure Therapeutic Grade Basic Sampler Essential Oil Gift Set at the 10 ml bottle size. Also available at Amazon is Edens Gardens complete 32 set (10 ml), great as a gift! 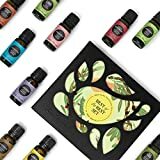 For those of you interested in more detail I also wrote in-depth post on my top eight best essential oil brands online. And don’t forget to take a look at what combinations work with our essential oil use chart.